Gift wrapping something in a truly special way doesn’t require expensive gift bags or elaborate decor. Are you ready to Wrap.Give.Repeat? Let me show you my simple gift wrapping techniques for gifts of all sizes. I have three special gift wrapping techniques I’d love to share. One is a pleated technique that’s really sophisticated. I also like to make gift bags with wrapping paper and tape for odd-shaped gifts. Third, I always use my leftover scraps of wrapping paper to make curled bows that coordinate. I popped in to the Walmart at my local mall to pick up a Scotch® Gift Wrap Tape 3 Pack Caddie and Scotch™ Multi-Purpose Scissor 8″. These items were located with the greeting cards and office supplies. I like to stock up on Scotch® Brand wrapping products so when I’m in a wrapping frenzy on Christmas Eve, there’s no chance of running out! 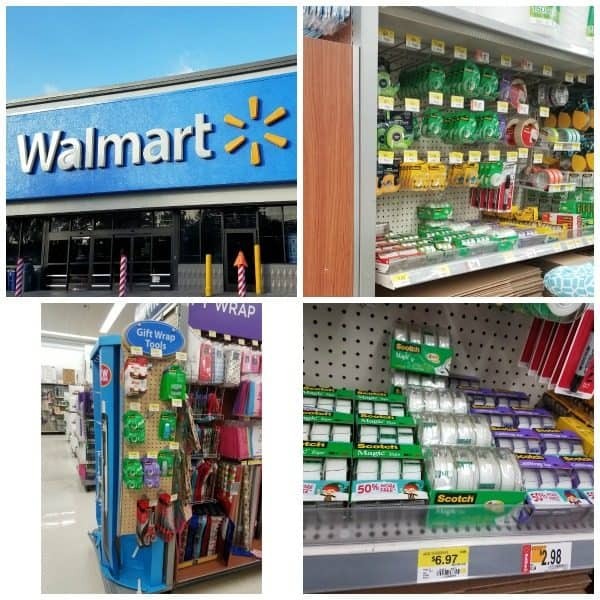 With the 50% bonus and Rollback pricing at Walmart, there’s no reason not to stock up and save. Plus my preschooler has been in a bit of “go crazy with the tape on everything” phase and has pretty much depleted every roll I had in the house! Before you pull out the gifts, be sure to have these things ready to go! Lots of room – Time to clear off your craft table or invade the dining room! Give yourself plenty of space to spread out. Resist the urge to wrap on the floor (your back and knees will thank me later). 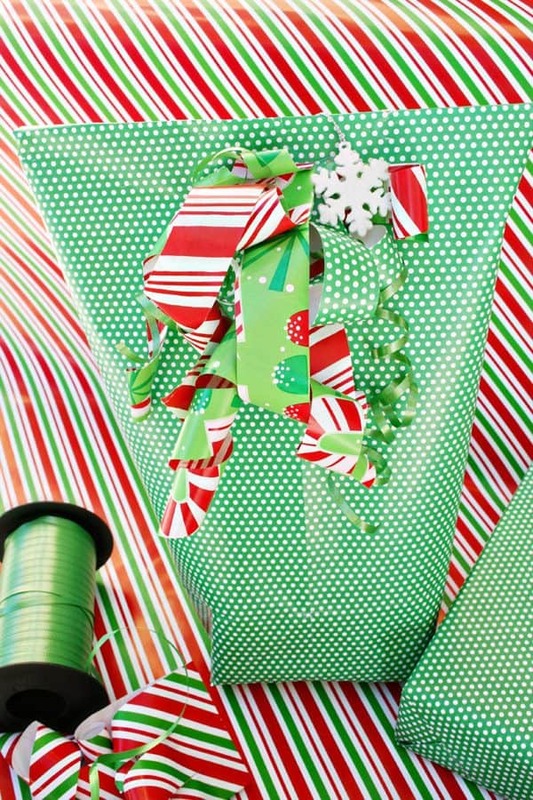 Thick, high-quality wrapping paper – You will not get the best results if you’re using thin paper that tears easily. But it doesn’t mean you have to indulge in expense; I pick up my wrapping papers the year before on clearance (I bought these last year at 75% off, for about a dollar per roll!) Choose paper that has the square inches lined on the back so you can cut the pieces straight. 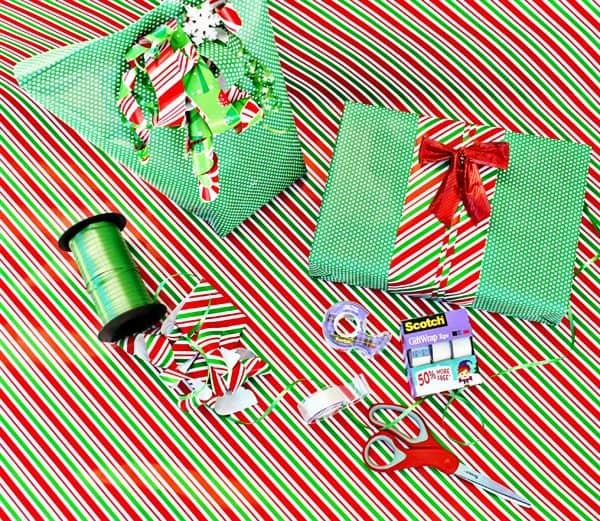 A pair of sharp scissors – Leave the utility shears in the kitchen and purchase a pair of dedicated gift wrap scissors to keep in the craft caddy. Scotch™ Multi-Purpose Scissor 8″ glide right through the wrapping paper, so you’ll have perfectly straight lines and crisp edges. A gift wrapping caddy -Inexpensive and handy, a caddy will keep all your wrapping supplies like Scotch® Gift Wrap Tape, scissors, ribbon and gift tags all in one place so you can grab & go when you’re ready to wrap! 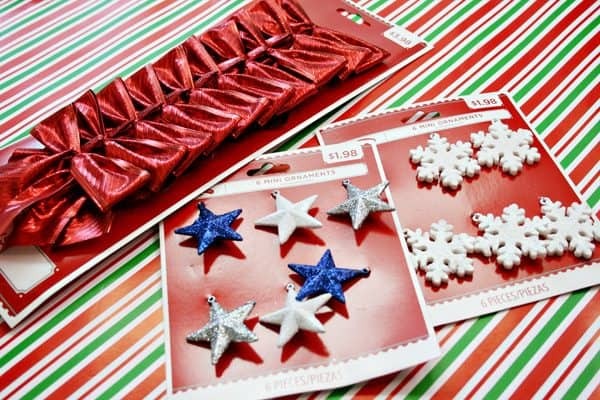 Special gift toppers – While at Walmart I wanted to find some cute package toppers and there were SO many to choose from! I actually found these in the section designated for decorating mini Christmas trees. I just thought they were adorable and the price was certainly right. I’ll be able to decorate every single gift under the tree with a mini ornament that can be saved or reused on another gift. My sister-in-law introduced me to a very chic wrapping technique that incorporates pleated folds in the wrapping paper to create an elegant look to each box. This works best on a flat box. You might want to use a bone folder and ruler for perfectly straight and crisp edges, though I was able to just eyeball it myself. Wrap the box as usual. Cut a coordinating strip of paper that will be pleated and wrapped around the box. Fold the paper in half lengthwise (wrong sides together). Then turn the crease to one side to create a pleat. Repeat the pleating several times, alternating sides. I created just three pleats but you can make as many or as few as you wish. Wrap the pleated paper around the box and match up the edges (trim them a bit if needed to help them line up neatly). 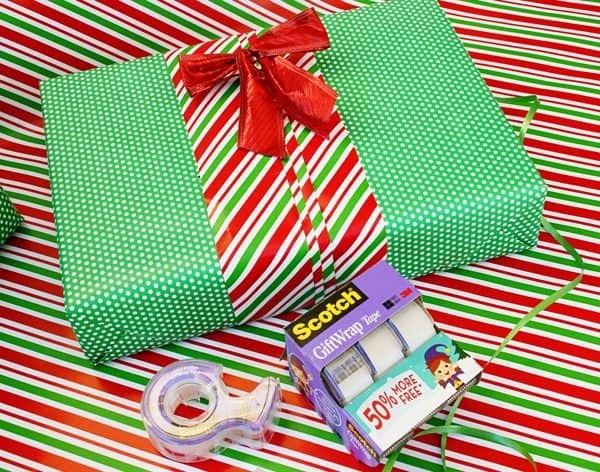 Secure the seam with a long strip of Scotch® Gift Wrap tape. The pleated wrap is an elegant and unique look that only requires a simple bow topper. I can’t wait to gift this one to my Mom! 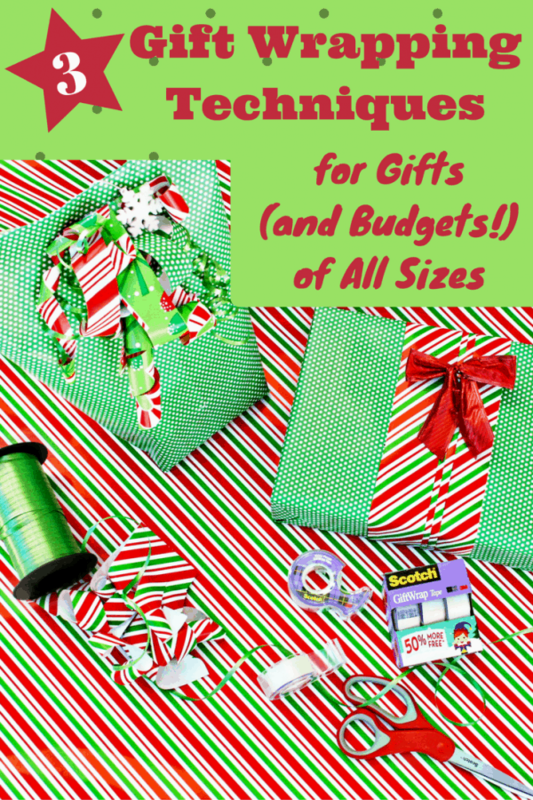 Take the odd shaped gift and lay it on the paper to get an idea how long to cut the paper. Add at least an inch for an overlap. Determine the center of the piece of paper (lengthwise). Bring the two ends of paper into the middle, overlapping. Crease the outside edges of the paper to make it flat. Now determine the width of the bottom of the bag. 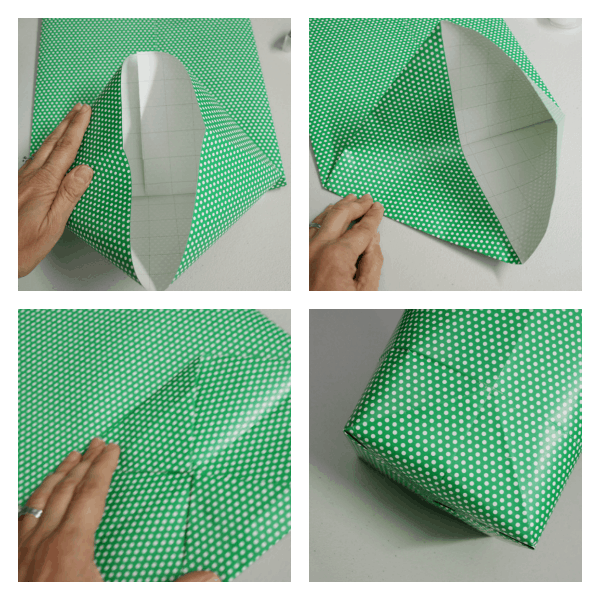 Fold up the bottom edge of the paper and place the bottom of the gift on top to determine how much to fold the edge (add about an inch or so on each side). Open up the folded bottom and use Scotch® Gift Wrap tape to close the lengthwise seam of the bag. Bend up the bottom of the bag at the crease. Press gently on each side and the paper will flatten itself into two triangle shapes, one on each side. Use your fingers to flatten the creases. Take the pointed edge at the top and bottom of each triangle and fold it down a few inches. 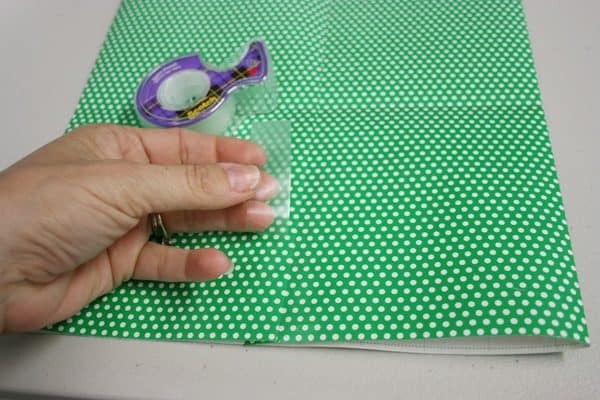 Use Scotch® Gift Wrap tape along all seams to secure the bottom of the bag. Open the bag from the top flatten out the bottom. Insert the gift to determine the height of the finished bag. 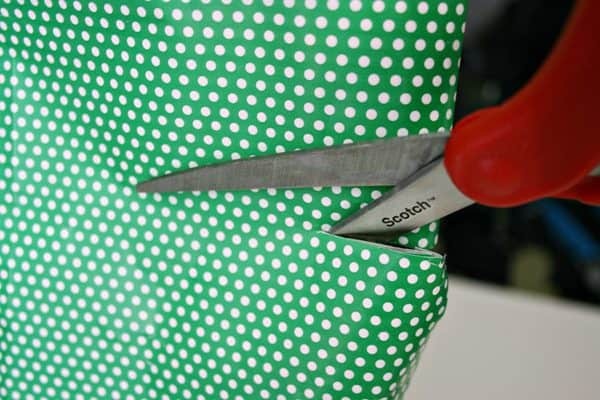 Trim off any excess paper from the top of the bag, then fold the top of the bag down and secure with Scotch® Gift Wrap tape. Keep reading on how to make the scrappy bow to decorate your bag! What to do with those strange long strips of wrapping paper that are leftover? I like to use every bit of extra wrapping paper so I use these leftover strips to make whimsical scrappy bows. 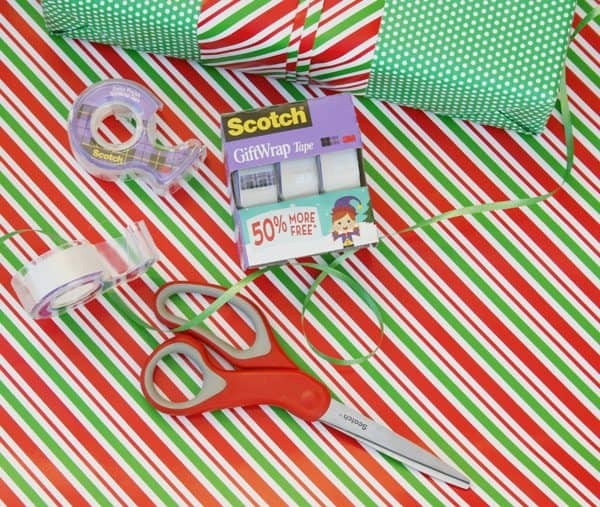 I curl the sturdy wrapping paper with the blade of my Scotch™ Multi-Purpose Scissor 8″ and then use Scotch® Gift Wrap tape to piece the bow together! It’s fun to coordinate the wrapping paper on the box to the wrapping paper bows. They really make a bold statement! 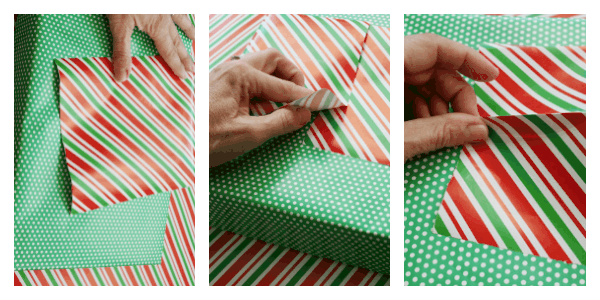 Collect coordinating strips of wrapping paper. On either end cut into the strip, cut narrow strips that are about 1″ wide. Leave a center section (about 1″) that is uncut. Hold the base of each narrow strip firmly. Open your scissors to expose the blade and run the edge along the underside of the strip of paper (just like you would with curling ribbon). Move slowly and adjust your pressure so as not to tear the paper. Coax the curl into place with your fingers. You may need to repeat the process on the same strip if the paper doesn’t curl the first time. Fold the bow in half and then in half again. Gently shake out the bow to loosen the curls and you can arrange them or trim them as needed. Add smaller pieces in coordinating papers by cutting, curling and taping them inside the first bow. Tape the bow to the package. For more depth, add a length of curling ribbon and a mini ornament to complete the bow! This holiday season Scotch® Brand will be donating $200,000 to Fisher House, a charity that provides a network of comfort homes where military and veterans’ families can stay at no cost while a loved one is receiving treatment. When making your seasonal donations, consider a donation to Fisher House via this link. 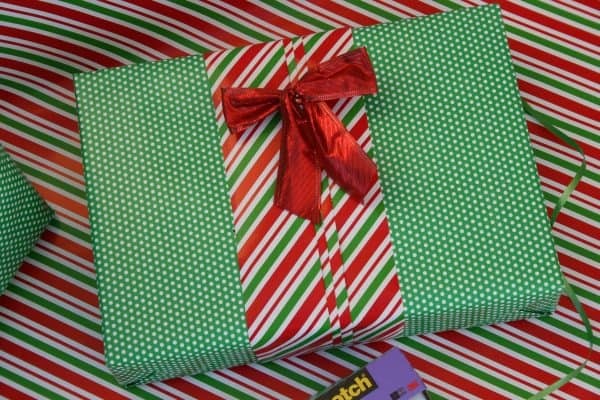 Are you a “Most Gifted Wrapper” with awesome gift wrapping techniques? How will you #WrapGiveRepeat this year?